Hold STCW certificate in Industrial/Marine as per Manila 2010 Amandements as well as certification as a Lifeboat Coxswain will be an advantage. Skilled in operating PC based software (MS Office). Previous experience in Facility/Ship certification such as ABS or other IACS member. Previous experience in fuel and boat movement management. Previous experience in the operation and maintenance of oil spill response equipment is preferential. Required experience for minimum 2 years in charge of ballast systems, cargo handling and Mooring operations. Previous experience in oil and gas floating facilities (FPSO, semi submersible, TLP, etc.) will be an advantage. Willing to work on shift schedule, on/off cycle and multitask environment in offshore. Have an excellent health. Applicants must be in above average physical condition as heavy lifting and climbing (stairs and ladders) are routine obligations. Fluent in English and Bahasa Indonesia, both verbal and written communication. Able to demonstrate the highest standard of integrity and ethical conduct in all business dealings and to builds and maintains trust, respects and supports others. Strong in seeking learning activities. Able to establish effective relationships with multicultural people in diverse organization. 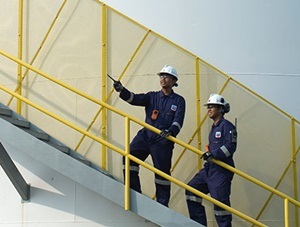 Education background in Marine Academy (Ahli Nautika Tingkat II or Ahli Teknik Tingkat II) or S1 Degree in Mechanical, Marine Transportation Management. Strong understanding about Marine Assessment and Assurance Process Standard (OCIMF MTIS). Required experience in marine industry for minimum 4 years . Has willingness to be relocated to Chevron operations locations (Riau or East Kalimantan). Minimum S1 Degree in Fiscal Administration or Accounting/Finance. Possess certification in Brevet A/B/C from recognized institution. Brevet A/B/C certificate from recognized institution is a must for a non-Fiscal Administration graduate. Required combination experience for minimum 4 years in public tax consulting firm or multinational enterprise. Previous experience in writing various tax advisory for internal organization. Previous experience in review cross border transactions including contracts. Have extensive exposure in handling tax audit and disputes (objection/appeal) and experience representing company before the Court. Experience in preparing and filing Corporate Income tax return and monthly withholding tax/VAT return. Exposure to PSC is preferable. Fluent in English and computer literate. Holder of tax court power of attorney (Kuasa Hukum Pengadilan Pajak) is preferred. Willing to be relocated to all Company operations locations in Indonesia. Minimum S1 Degree in Petroleum engineering, Mechanical Engineering, Chemical Engineering. Required combination experience in PSC for minimum 4 years. Required experience in drilling and workover operations or related services supporting Drilling and Completions for minimum 2 years. Previous experience as Drilling/Well Site Manager will be an advantage. Excellence in establish effective relationships with multicultural people in diverse organization. Excellence to demonstrate the highest standard of integrity and ethical conduct, and to build and maintain trust, respect and support others. Having valid APB/APS, IADC/IWCF certification will be an advantage. JobsCDC.com now available on android device. Download now on Google Play here. Please be aware of recruitment fraud. The entire stage of this selection process is free of charge. Chevron Indonesia - Marine Operation Specialist, Tax Analyst, Well Site Manager Chevron September 2018 will never ask for fees or upfront payments for any purposes during the recruitment process such as transportation and accommodation.